CAMERA: Nokia 8 features a 13 MP dual image-fusion rear camera with both colour and monochrome sensors, plus a wide-angle 13 MP phase detection auto-focus front camera. Both front and rear cameras are equipped with ZEISS optics, meaning every snapshot moment becomes a story worth sharing. 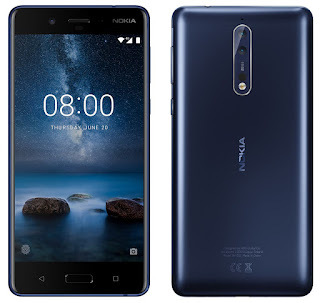 os : Nokia 8 comes with Android Nougat 7.1.1, packed with the full spread of Google's most popular apps and no unnecessary extras.